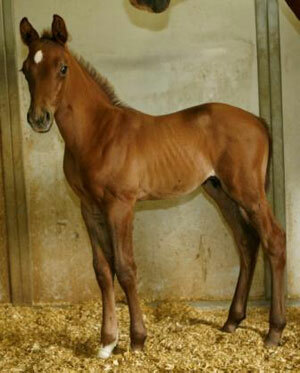 A colt foal has been born who is the clone of champion US showjumper Gem Twist. Owned by the Chapot family, the cloned colt is a full thoroughbred, and will be a sought-after outcross for warmblood showjumping mares. The colt was cloned by equine cloning company Cryozootech. Breeders looking for thoroughbred stallions to bring more blood in their genetic pool have a limited choice of thoroughbred jumping performers. There are very few competing at a high level and almost all of them are geldings. Gem Twist, who died in November 2006, was named Horse of the Year three times and was a double silver medal winner at the Seoul Olympic games, and was named "World's Best Horse" at the 1990 World Equestrian Games. The project to clone Gem Twist began in 2006, when Cryozootech founder Eric Palmer was looking for exceptional horses for his cloning project. He said Gem was the type of horse he was looking for: an outstanding horse but without progeny because of early castration, the best candidate for cloning. He contacted Frank and Mary Chapot, who approved the cloning project. The grey thoroughbred gelding was born in 1979. His dam was Coldly Noble, a racehorse given to the Chapot family. His sire Good Twist had won many international classes in the US and Europe with Frank Chapot in the 1960s. Good Twist is from the American "Bonne Nuit" line which produced many horses on the US Team, including Olympians Miss Budweiser (Circus Rose) and Riviera Wonder. Gem Twist with Frank Chapot. In late 1984, Greg Best, then a relatively unknown 19-year-old began to ride the five-year-old and they entered the grand-prix ranks in early 1987. 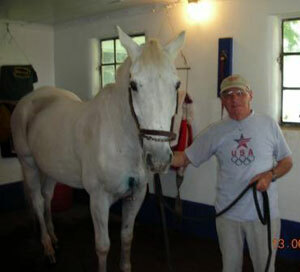 Six months later they helped the United States Equestrian Team bring home a team silver medal at the Pan American Games. In 1988 they won the team and individual silver medals at the Olympic Games in Seoul, Korea. Gem earned the title "World's Best Horse" in 1990 at the World Equestrian Games where he had the fewest faults out of 78 horses in the event's five preliminary rounds and the fewest in the final four rounds with four different riders. In 1992 an unlucky slip during the approach to an oxer at the American Gold Cup caused Gem to crash through the jump. While Gem was unharmed, the injury put Greg out of commission for several months. Leslie Howard took over and had instant success with Gem, winning the 1993 Horse of the Year. Gem Twist at the Seoul Olympics in 1988. Gem Twist is the only horse who earned the Horse of the Year honour three times. While at The Hague for the World Equestrian Games in 1994, Gem developed an infection in his suspensory that put him out of competition for almost a year during which Laura Chapot spent hours each day massaging his muscles and soaking his legs in a whirlpool. Laura became his partner in 1995 and she won her second grand prix with Gem, the $100,000 Autumn Classic in Port Jervis, which, along with several other placings, awarded Laura the 1995 AGA Rookie of the Year title. 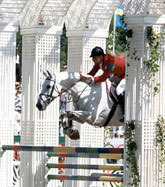 Gem won the AGA Championship three times, each time with a different rider. Gem retired during a ceremony in New York's Madison Square Garden on November 1, 1997.